With a month and a half to go until the launch of its next-generation BlackBerry phones, Research In Motion is finally starting to take the wrappers off its make-it-or-break-it devices. On Tuesday, the Waterloo, Ont.-based company announced the release of the final version of its software development kit for the BlackBerry 10 operating system, or the tools that developers will use to create apps for the new devices. App developers are now cleared to make their final tweaks ahead of the unveiling of the official BB10 phone on Jan. 30. RIM is also in the midst of a cross-continent road show, with a stop in Toronto on Tuesday, where the finer points of the nearly finished operating system are being demonstrated to journalists. After an hour with the new device, it’s safe to say BlackBerry loyalists have reason to be optimistic, even if larger questions still loom. Whether the new devices will be able to fight off tough competition in the consumer space from Apple and Android is an open question, but they will offer some nice productivity and work features for RIM’s bread-and-butter business users. The phone shown in the demonstration was the Alpha B, an all-touch-screen pre-production model that has been given out to about 6,000 app developers over the past few months. RIM is planning to officially release a final, as-yet-unnamed version of this phone shortly after the coming-out party at the end of January. Whether the new devices will be able to fight off tough competition in the consumer space from Apple and Android is an open question. A second phone – which will resemble a Bold, with a physical keyboard and smaller touchscreen – will follow shortly after, with pre-production “Alpha C” models being sent to developers soon, the RIM spokesperson said. 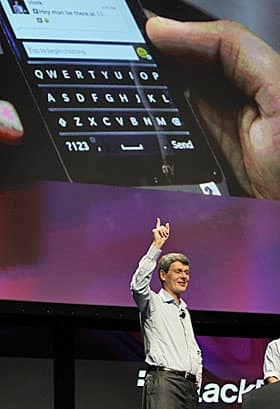 For many BlackBerry users, the keyboard is key – and the main feature that separates the phones from rivals. Indeed, many current holdouts say they still prefer outdated, older BlackBerrys to newer smartphones simply because they hate touchscreens. With BB10, RIM is attempting to ease some of that disdain with a redesigned touch keyboard that introduces three functions for easier typing. The first are three silver “frets,” or thick lines that separate the four rows of keys on the QWERTY keyboard. The frets create a sort of psychological barrier between the rows, which makes for better subconscious separation of the keys by the user and therefore fewer spelling mistakes, the spokesperson said. The keyboard also uses a form of predictive text that anticipates the next word to be typed. If the user types “Hi, how are,” for example, then the word “you” appears over the Y key. If that’s indeed the desired word, the user can then swipe up on the Y and the whole word is automatically input. You also don’t have to keep hitting the backspace button to delete a word if you make a mistake – that’s accomplished by swiping from right to left on the keyboard. As an extra bonus, you can set three languages and switch between them while typing, with the predictive text working for all of them. The third addition is a sort of keyboard underlay, or an invisible keyboard under the one seen on the touchscreen. This one learns, then subtly shifts and adapts according to where its user presses. So, if you’re always slightly off in hitting the R key, for example, the invisible keyboard will adjust accordingly. While these sorts of functions will be better judged over a longer test period, they did seem to work well during the demonstration. Swiping predicted words may take some getting used to, but if the algorithms powering the function work properly, it’s a feature that might speed typing up significantly. RIM is also going for a faster and smoother interface with BB10, a fact that is most noticeable by the almost heretical lack of a “home” button. While there is a sort of home screen that houses the standard grid of apps, you move around screens by swiping in from all four edges of the phone, or what the company calls its “Flow” interface. Swiping down from the top brings up settings, while swiping up takes you to open applications, or “active frames,” of which you can have eight running at once. Swiping from left to right reveals the main messaging “BB Hub,” a grouping of all your email, text messages, LinkedIn notifications, tweets and other communications, while going the other way brings you back to whatever you were doing before. Again, the lack of a home button may initially seem weird to anyone used to an iPhone or Android device, but the fluid screen motions feel like something you could easily warm to. Indeed, the swipe-heavy interface of the PlayBook, RIM’s tablet, is one of its most enjoyable features. The Contacts app also integrates with messaging, so aside from getting a person’s phone number or email address, you can look at their recent updates from LinkedIn as well as a history of interactions with them. The Calendar app also smartly bolds days that have more appointments, so you can easily see when your schedule is swamped and when it’s lighter. BB10 will also feature the recently announced update to the BlackBerry Messenger app, which adds free Voice over Internet Protocol calls over wi-fi (think Skype) to the standard text messaging option. The update is already available for existing BlackBerry 7 devices. Lastly, the new operating system also lets users separate their personal stuff from work-related things with Balance, a feature that essentially splits media and apps into two user profiles. You can keep pictures of your kids in your personal profile, while professional images and documents are stored in the work profile. It’s a handy addition because it means you can avoid accidentally showing that photo from your weekend drinking binge when you’ve hooked your phone up to the boardroom projector. Will all of this be enough to woo new users and prevent existing ones from defecting to competitors? With RIM still playing some cards close to its figurative chest – such as pricing, the phones’ eventual hardware specifications and how many apps will be available – it’s hard to judge right now. One thing that is clear is the BB10 operating system now appears to be finely polished and ready for prime time. It will offer business users some genuinely useful features, but in the larger consumer world, RIM will still have to contend with competitors that have significantly more developed app ecosystems. Chief executive Thorsten Heins says the company is aiming for quality apps over quantity. So far, though, it’s the phone makers with the most apps that are running away with the market.